"Hola! 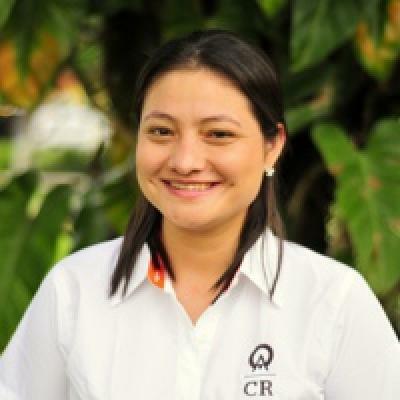 I'm Angelica, and I’ve been working in tourism for nearly a decade. I started out as a receptionist at a hotel, and am now a happy member of Anywhere's Operations Team. It’s incredibly satisfying to know that I help travelers like you experience the best of Costa Rica — getting you into the “Pura Vida” mindset, and helping you connect with some of Costa Rica's best cultural and natural attractions. Working in tourism provides me with the opportunity to learn more about my own country. My favorite places in Costa Rica are the beaches — especially the Guanacaste area. The people here are very friendly and care about the environment. I also enjoy visiting national parks and volcanoes, like Arenal Volcano National Park, Poas Volcano, and Irazu Volcano. I’m a nature lover and try to get outside whenever I can — whether I'm bicycling, walking, or spending time with my family and friends, I'm always happy to enjoy the fresh air. Outdoors aside, one of the things I most love about Costa Rica is our sense of community; if you want an 'authentic Costa Rican experience,' Anywhere can connect you to tons of local activities! Example: Don't want to miss church even though you're on vacation? You don't have to! I can relate...I'm in my church's band! I love to sing and play the guitar, and I can't wait for us to discover how we're going to add your talents and interests to your personalized itinerary." Jason was a pleasure to work with!